Very much a throwback to the type of movies Hollywood used to make, A Most Wanted Man is that rare breed of contemporary film; a stylish, sophisticated thriller for an intelligent adult audience. Sadly, this latest cinematic rendering of a novel by Jon le Carre (Tinker Tailor Soldier Spy, The Constant Gardener) is the last film that Philip Seymour Hoffman completed before his sudden death earlier this year and the film serves as a fine testament to his considerable skills as an actor. Directed by Anton Corbijn, A Most Wanted Man plays out in Hamburg, a city on high alert in the aftermath of the September 11 attacks in New York. Hoffman is Gunther Bachmann, the leader of a small German anti-terrorist unit whose role is to infiltrate and monitor the goings-on within the Muslim community. When Chechen immigrant Issa Karpov (Grigoriy Dobrygin) arrives in the city illegally and lays claim to a significant inheritance, suspicions are aroused and he soon finds himself under scrutiny from both Gunther and American security agencies. This is not an action film. There are no elaborate fight sequences or car chases, yet the story remains gripping until the very end. 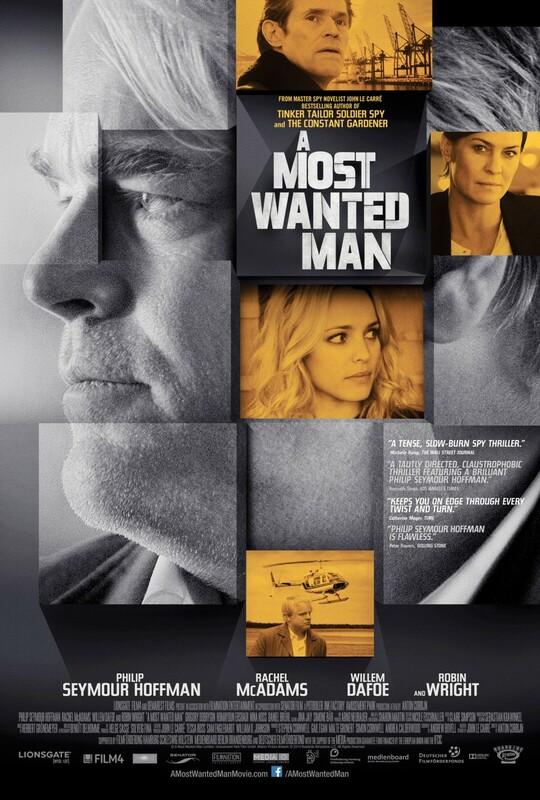 Rich in subterfuge, A Most Wanted Man is atmospheric and ambiguous. Surviving on cigarettes, whiskey and coffee, Bachmann is an unkempt yet highly capable figure; an old-school operative relying on a network of informants rather than sophisticated technologies to keep tabs on any potential threats. Whilst Bachmann is content to keep Issa under surveillance in the hope that it will lead to something of significance, his American counterparts are far less patient and set about undermining his efforts. The film is actually very critical of America in their approach to handling such situations; their determination to make arrests at all costs and their willingness to undermine the local authorities for immediate results is at odds with Bachmann’s longer term surveillance strategy. Robin Wright is cold and calculating as CIA representative Martha Sullivan, while Rachel McAdams is the idealistic human rights lawyer caught in the middle. Hamburg, the city from which the World Trade Centre attacks were orchestrated, is presented as a very bleak locale in which all Muslims are under constant scrutiny as potential threats. The screenplay from Australia’s Andrew Bovell combines very effectively with Benoit Delhomme’s cinematography to create a murky world in which right and wrong are not necessarily oppositional constructs. This world is very much in keeping with le Carre’s deglamorised vision of spying and intelligence gathering, presenting it as a taxing – both physically and psychologically – and somewhat thankless job that, like any other, is often compromised by the so-called superiors whose own agenda is far removed from the efforts of those on the front line. Willem Dafoe also features as a bank executive and therein lies my only real beef with this film. It is not Dafoe per se, who is fine, but rather the use of American actors as German characters who speak in accented English which only serves to undermine the credibility of the piece. Don’t get me wrong, all of the cast are strong and Hoffman really personifies the jaded yet morally upright Bachmann, but surely, at the very least, the dialogue could (should?) be delivered in German in all situations in which it would be logical to do so? Language choices aside, this is a stylish film that ends with a most unexpected flourish. Determinations of innocence and guilt are driven by factors other than the facts at hand – such as a desire to be seen to be making inroads into terrorist networks – and the film very effectively conveys the different approaches to what is supposed to be a shared objective, namely “keeping the world safe”. The Dutch-born Corbijn, whose previous features are the fine music biopic Control and the George Clooney-starring thriller The American, has crafted an engrossing, unsettling, and highly provocative film. Unlike most films set within a post-9/11 anti-terrorism landscape that present events from an American perspective in which the goodies and the baddies are clearly defined, A Most Wanted Man is a reminder that there are, in fact, myriad shades of grey that sometimes make it very hard to separate the righteous from the reprehensible.